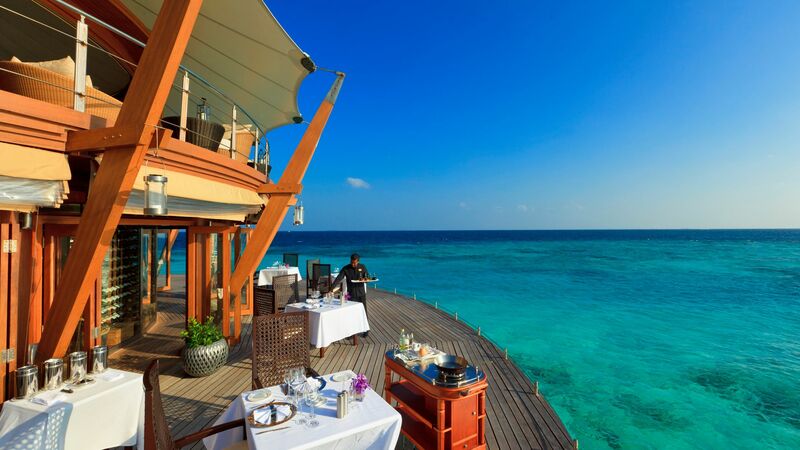 The Baros Maldives Resort is a luxury sanctuary situated on its own tropical island. Indulge in a world of luxury and natural beauty dotted with hammocks, thatched roofs, and inviting villas. Select from overwater and beachfront villas, with chic interiors and lavish outdoor bathrooms. There is an excellent collection of restaurants, serving mouth watering local and international cuisine, in addition to a choice of unique dining experiences, tailored to your requirements, to contribute to an unforgettable holiday. 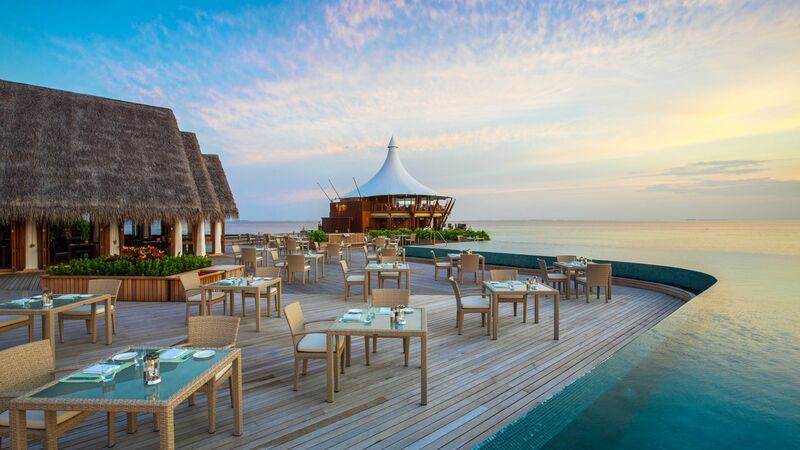 Sample beachside or overwater dining, accompanied by impeccable Maldives hospitality. 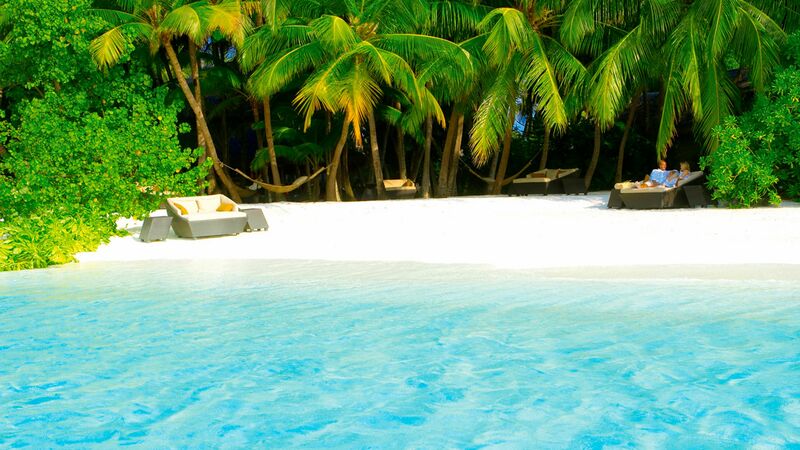 Immerse yourself in an oasis of calm and relaxation, in one of the first resorts in the Maldives. 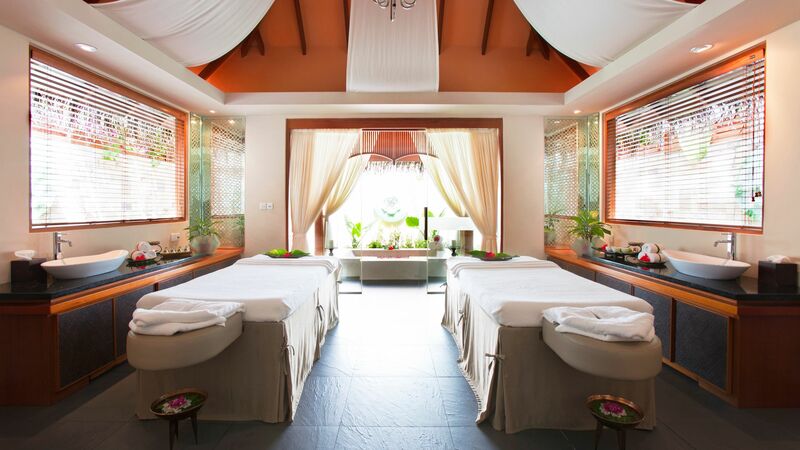 Indulge in a variety of treatments and massages at the luxury spa, or soak up the sun on the pristine, white sandy beach. Take a dip in the overwater infinity pool and enjoy stunning ocean views or try excursions from sailing to sightseeing, allowing you to fully appreciate the exquisiteness of the Maldives. Hotel child prices apply to ages 8–11 years. Sovereign does not accept children in the water villas or over water categories. Indulge in a Nooma dining experience at sunset for an unforgettable holiday treat. Board the resort’s wooden sailing boat and enjoy a romantic cruise with cocktails and dinner, while being looked after by first class staff. If you can tear yourself away from the outstanding restaurants, sample a unique dining experience. Select from in-villa dining to island dining, wherever you choose and enjoy a romantic picnic or dinner under the stars on a sandbank surrounded by the ocean. 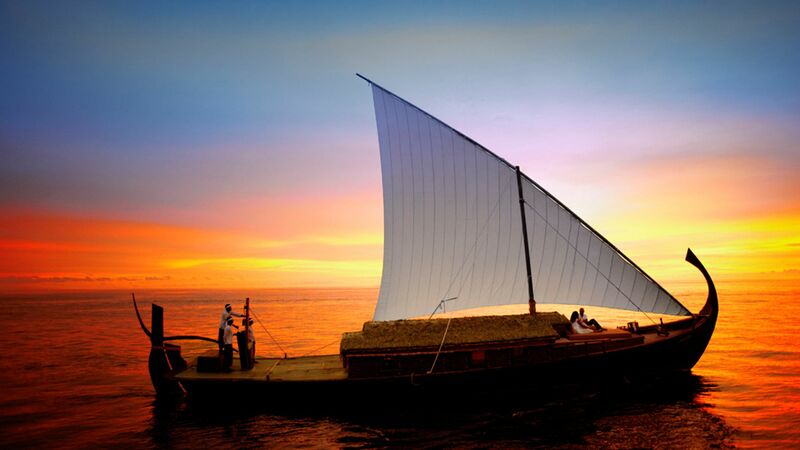 Alternatively, take to the traditional Dhoni sailing boat and indulge in a sunset cruise. Sit out on the deck and enjoy panoramic sea and sunset views as you sip on a cocktail or champagne, accompanied by delectable canapés. Once a week you can enjoy live music from local artists. Indulge in lavish lagoon-side dining al fresco style and sample contemporary cuisine with an Asian twist. Stop for a delicious buffet breakfast, tasty snacks throughout the day, and fresh fish specialities for dinner while overlooking the blue lagoon. Open: 07:30 – 10:30 and 11:00 – 22:30. Located in the heart of the island, guests can sit on the sand under the swaying palms or in a hammock with a signature cocktail while listening to calming music. Appetising afternoon tea is also available. An icon in the Maldives, the Lighthouse Restaurant resides over the ocean with its white sail blowing in the cool breeze. 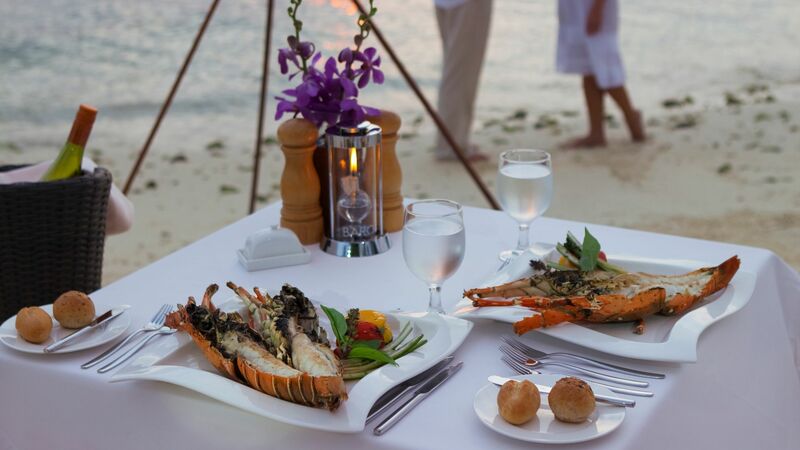 Sit under the stars and sample fresh seafood, tender steaks and international favourites infused with exotic flavours. Indulge in succulent cuisine combined with mesmerising sea views. Enjoy intimate al fresco dining over the lagoon where you can sample a la carte dishes fused with Indian flavours. Taste the finest grilled meats and seafood cooked to perfection accompanied by premium wines. The Teppanyaki table and wood-fired oven will seduce you with flavours from around the world. Open: 12:00 – 16:00 and 19:00 – 22:30. Take a dip in the freshwater swimming pool, which is situated in the overwater pavilion next to Lime Restaurant. 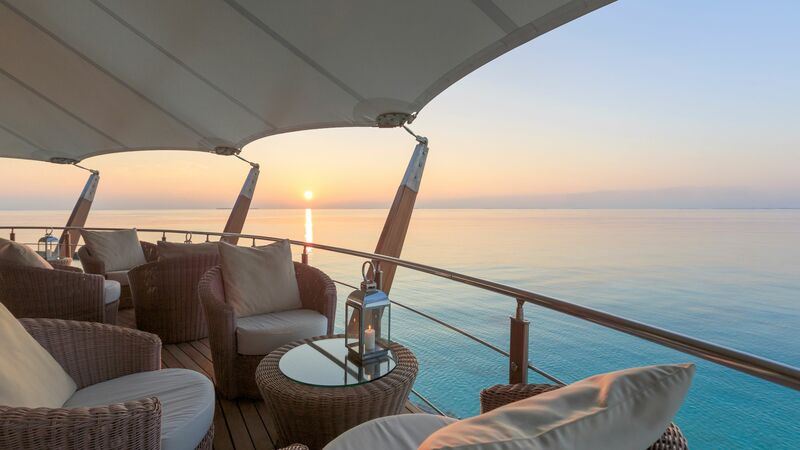 Soak up the sun from its plush sun loungers along the deck looking out to sea. The island is surrounded by a powdery, white sandy beach lapped by the turquoise warm waters of the Indian Ocean, perfect for snorkelling and diving. 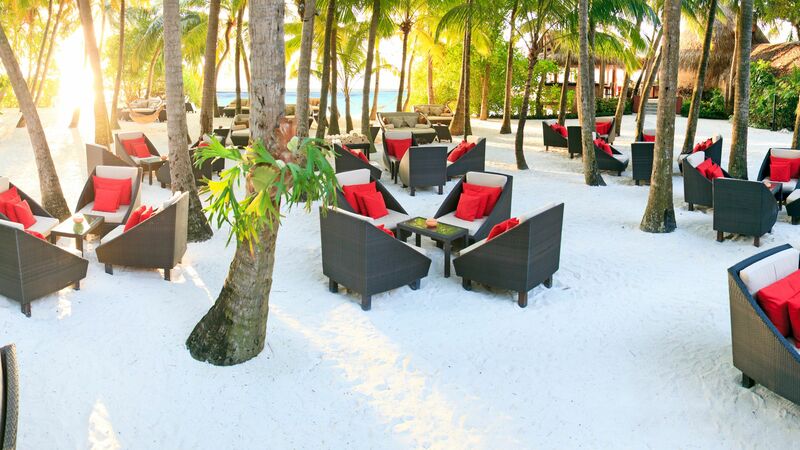 Enter a haven of rest and relaxation hidden in the trees of the hotel’s tropical garden. Enjoy beauty rituals and massages from within the pampering private suites or in your own villa, or take the opportunity to indulge in a steam bath. Children over 8 years are able to use the spa when accompanied by an adult. Experience the sparkling waters, luscious islands and white sands from a different angle with seaplane tours, which can be arranged by the hotel. Guests can also hire an expert guide to take them to the Maldives’ capital, Male. The five star PADI Gold Palm Dive Centre promotes environmental awareness and preservation of the coral reefs. The centre organises diving courses in addition to a variety of trips to stunning dive sites suitable for all levels of experience, with refresher dives and night dives also available. The Marine Biologist also offers snorkelling excursions. 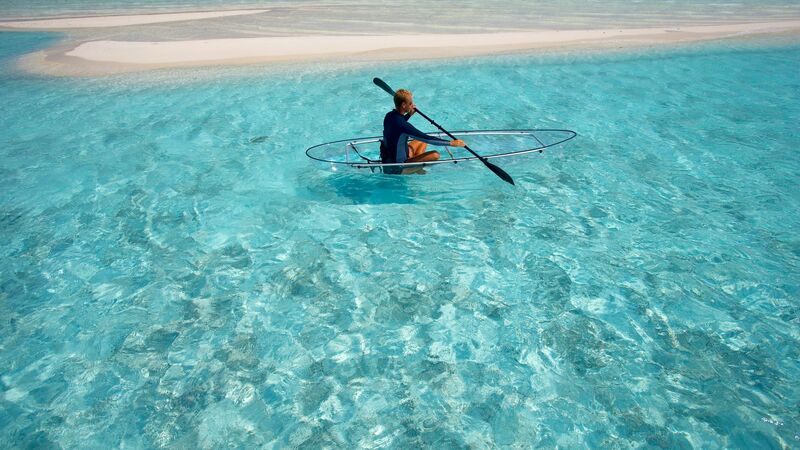 Float over fish in your transparent kayak and witness the stunning marine world, or take to the waters on a wakeboard. Try paddle boarding and water skiing or for something different, take on the Fun Tube Ride. Baros Maldives Resort is situated on one of over 1,000 stunning islands in the Indian Ocean which make up the Maldives. Here you’ll find white, powdery sands accompanied by turquoise blue lagoons and home to exquisite marine life and tropical coral reefs. Each island has its own deluxe hotel, creating an ideal secret hideaway of luxury. Select from magnificent and lavish accommodation to rustic, chic retreats typical of the Maldives. It’s also a mecca for divers, and being surrounded by the sea, fresh fish is the order of the day and a key ingredient in mouth watering Maldivian cuisine. 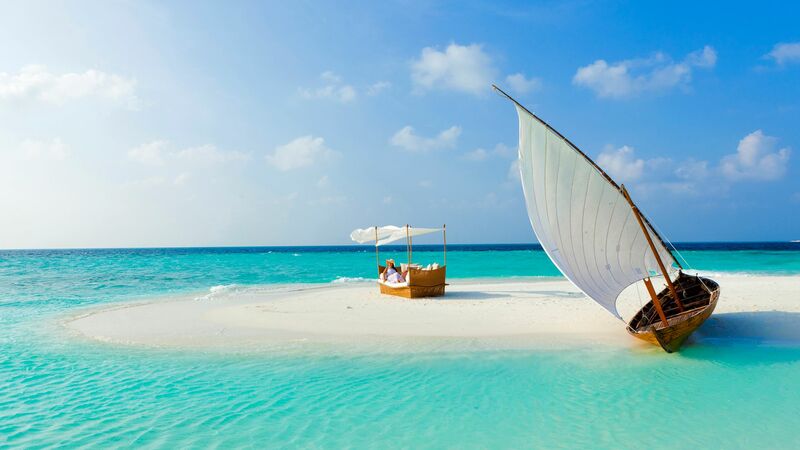 Baros Maldives is 25 minutes from Male Airport via speedboat. The beautiful Deluxe Villas feature an open air bathroom surrounded by a walled garden with an outdoor shower, a spacious shaded veranda and a direct access to the beach. The private and secluded Baros Villas are located by the beach, surrounded by a tropical foilage. Each villa features an open air bathroom with walled garden and outdoor shower, shaded veranda leading to a wooden deck with sun loungers and a direct access to the beach. 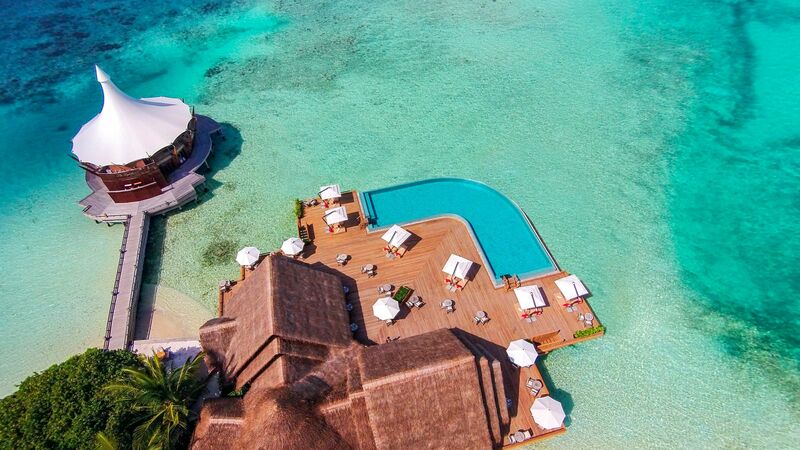 Reached by a wooden jetty, the Water Villas offer a secluded oasis with endless views of the ocean and horizon. Each villa has a large wooden deck with canopied four-poster bed, sun loungers and dining furniture and wooden steps leading directly into the lagoon. Screened by lush tropical foliage, the Baros Pool Villas offer the ultimate in privacy. The secluded spacious wooden veranda with canopied four poster bed and sun loungers leads to a private infinity plunge pool and a direct access to the beach. Honeymoon guests staying in a Deluxe Villa, Baros Villa or Water Villa receives a bottle of sparkling wine, chocolates , one honeymoon photo in a Baros photo frame, one candlelit dinner for two (based on set menu) for holidays between 01 January 2019 - 10 January 2020. 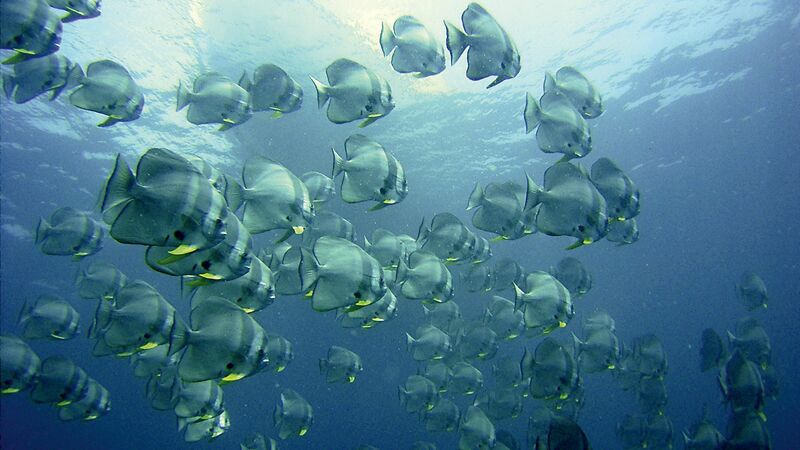 Outstanding service, spectacular location, wonderful underwater life. A fantastic location, and a perfect holiday for couples. Great snorkelling. We were there for 10 days, and have come back relaxed and refreshed. “ Amazing resort for family retreat. We booked the resort more than one year in advance. As we are a family of 4 with 8 yo twins so we were looking hard for a nice resort that (1) has its own house reef with easy access even for kids (2) doesn?? ?t require seaplane for transfer. And Baros came up the top of our lists. We had a peaceful stay at Baros for 5 days. We stayed in a deluxe villa and a water pool villa. Both are nice in s different way. Our villa host, Sam, was very very kind and did everything he could for us let it be adaptor, SD card reader etc. We were allowed late checkout on our 4th night and we enjoyed the extra time we had at Baros. Marine centre staffs were very helpful. We saw a lot of sea animals such as sharks, spotted eagle ray, turtle, octopus, butterflyfish and many more. The coral was not as colorful as expected but there were still a lot of animals. What do I want to say, actually everything was already said here in TripAdvisor. This was our second visit to Baros, the first was back in 2006. Our expectations were very high, and we were not disappointed. Baros is a glittering pearl in the Indian Ocean and one of the best resorts on the service side for us. Coming back to Baros is like, coming back home. The island is in excellent condition, the staff are all very helpful and friendly. The philosophy of Baros is not fixed, it is lived every day. Jay, the General Manager of Baros is everywhere nearby and he cares a lot about his guests. I would also like to mention the absolutely great service from our villa host Azzam who looked after us for our stay. He was around every corner to make sure we had everything to make our holiday perfect. Breakfast, a few words: fantastic, delicious, Best of the Best. The same goes for dinner. The Lighthouse Restaurant - outstanding, out of this world. I could keep writing for hours, but most of it has already been written down. Baros is magical, we had an amazing holiday and we are planning a return trip this year.